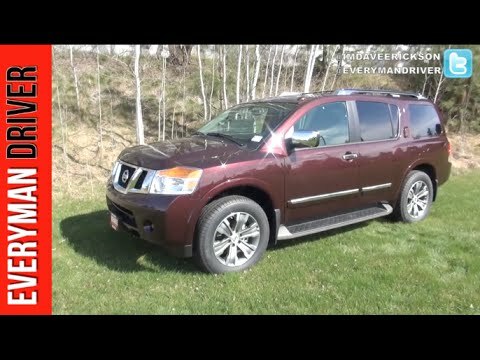 The 2015 Nissan Armada is a throwback to when SUVs ruled the roads, literally and figuratively. Virtually unchanged since its 2004 debut, this big full-size SUV boasts a powerful V8 with an equally powerful thirst, up to 9,000 pounds of towing capacity, seating for eight, and plenty of electronic gadgets to keep you happy. Even though the armada is big it rides so smooth and has so many luxuries! Love my Nissan armada. It has plenty of room since it has the third seat. Even though my Nissan has 3 seats it still has plenty of legroom. I love how easy the seats fold down weather I am hauling my grand kids or hauling stuff for our farm it is so convenient to have. My husband would not dare let me trade my armada he loves the smooth ride and the power it has. We have taken it on lots of business trips and everyone that rides with us cannot get over the comfort in it. The only drawback to the Nissan armada is it really loves gas, but everything else about it is great! This is the second Nissan armada I have owned and if it weren't for Nissan changing the body style than I would buy another one. Otherwise I'll have to keep my 2015! Love that all 5 kids fit perfectly! I love my armada. I have 5 children and there is plenty of room for them all, and a friend. It drives great. It have 4 wheel drive so I am able to get around the snowy hills in my neighborhood. I have had no major issues and keep up with regular maintenance. The only think I have had to do was my struts. Also, the only thing I don't like about it is the gas mileage. It does great for trips on the freeway, but when all I do is drive back and forth to schools all day, it seems to guzzle gas fast. Our brakes are constantly deteriorating, the performance is great though, it seems reliable enough as I have seen older armadas with 100’s of thousands of miles on it. It is a super comfortable truck, the seats are not too soft to not have support but soft enough with enough support to make it comfortable. I love that the radio shows the name of the artists and the song playing. I also love how loud the radio can go and it does not sound staticy. Nissan will notify owners, and dealers will inspect the both front seat belt buckle assemblies, replacing them as necessary, free of charge. The recall began on September 14, 2015. Owners may contact Nissan customer service at 1-800-647-7261. Nissan North America, Inc. (Nissan) is recalling certain model year 2015 Nissan Armada vehicles manufactured September 15, 2014, to October 14, 2014. Due to interference between the parking rod and the transmission housing, the parking pawl may not fully engage. This condition may allow the vehicle to move with the shifter in the "Park" position, increasing the risk of a vehicle crash. Nissan will notify owners, and dealers will inspect the casting date stamp on the transmission housing and replace the affected transmissions, free of charge. The recall began January 19, 2015. Owners may contact Nissan customer service at 1- 800-647-7261.